Is Continuous Downstream Processing Becoming a Reality? Over the past 30 years, several biopharmaceuticals have been produced by continuous cell culture processes run in a chemostat or perfusion mode. In most cases, no alternative was available to produce certain unstable molecules (1). However, downstream processing is and has remained a step-by-step batch operation. Continuous processing generally requires more process knowledge, equipment, and technological advances than do batch processes. With the maturity of bioprocessing and increasing awareness of manufacturing costs, companies are focusing on developing continuous downstream processing (CDSP). A 2007 cost study concluded that switching from batch processing to CDSP of monoclonal antibodies (MAbs) could reduce operational costs by almost 70%, a very promising means of increasing production chain economy (2). Most important, a focus on cost reduction. Processes can run in several ways. In fully continuous mode, each unit operation runs continuously, and connections allow continuous flows. In end-to-end continuous mode, inputs and outputs are continuous, but intermediate processing operation units can be conducted in batch mode. 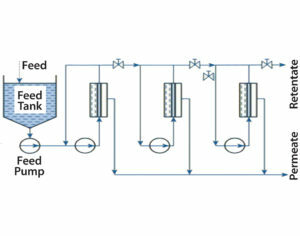 In hybrid mode, parts of a process run continuously and other parts run in batch mode. Semicontinuous processes can run continuously only for a short period. Truly continuous processes work full time (24 hours a day, seven days a week) with no product-hold steps. Very few downstream unit operations can run in steady-state conditions, with concentrations kept constant or reactions and growth occurring at constant rates. Product/impurity concentrations of inputs, intermediates, and outputs typically change. Unit operations that run in countercurrent flow show improved process efficiency. And it is important for final product outputs derived from continuous processes to be homogenous. Choices made in biopharmaceutical downstream processes depend on expression systems, upstream processes, and primary recovery operations. Along with increasing demand for MAb drugs and the possibility of developing platform processes, in recent years the industry increasingly is focusing on continuous MAb purification. The following sections share that focus. A number of technologies enabling CDSP of biopharmaceuticals have been available for some time. Examples include in-line mixing devices, pumps, disk-stack or basket centrifuges, and heat exchangers. However, in certain cases the technology must be adapted in response to applicable engineering norms — e.g., from the American Society of Mechanical Engineers (ASME) — regarding contamination risk and/or qualification. Driving factors that push suppliers to develop continuous technologies include material compatibility constraints (e.g., high salt concentrations) and the intention of some companies to use single-use process lines, as well as the need for fully integrated and controlled unit operations (e.g., in-line dilution systems). 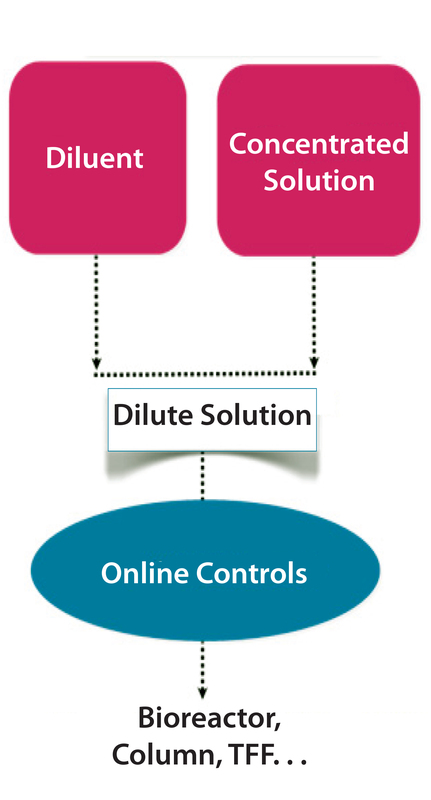 In-line dilution (ILD) systems have a broad range of applications, the most important of which in terms of cost include buffer and clean-in-place (CIP) solutions. Use of concentrated stock solutions and ILD (Figure 1) with chosen water quality at the time of use can downsize installations greatly while reducing capital expenditures and operational costs (5). These days, buffer concentrates in disposable bags can be integrated into most commercially available standard ILD systems. Of the newer CDSP technologies, the most important is continuous chromatography. 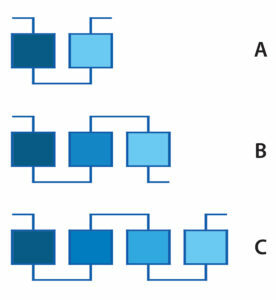 Currently a number of suppliers offer different approaches that use different numbers of columns, as in Figure 2 (6). Some qualified systems already are used for producing clinical material. Productivity gains and reductions of processing volume achieved by switching from single to multicolumn continuous chromatography processes are reported in the range of 1.8-fold to 2.9-fold (7). An important advancement yet remains before this technology can enable commercial manufacturing: Process robustness must be demonstrated and validation must be successfully performed. Not only the chromatography processes, but also separation media have developed over the past few years. Major improvements have increased physical and chemical stabilities, allowing for processes to be run at higher flow rates and with more stringent process solutions than before. Media with very tight particle and pore-size distributions are becoming state of the art, improving long-term process performance (important for continuous processing). Finally, binding capacities of affinity (mainly protein A) and ion-exchange (improved salt tolerance) media have improved significantly. All these improvements allow for downsizing of chromatographic unit operations. Another important technology family in DSP is based on membrane separations. Several membrane-based separation techniques are integrated in MAb purification: e.g., depth and sterile filtration to reduce or prevent particles/bioburden. All devices used for these techniques typically run in frontal (dead-end) mode. However, membranes used for concentration and separation of molecules, media exchange, and formulation steps typically run in tangential- or cross-flow mode. Dead-end filtration is a batch process. With alternating filter devices run in parallel, however, a continuous inlet flow can be treated and a continuous outlet flow reached. Such methods are already established in some manufacturing facilities for sterile and particle filters for back-up use in case of system failures. Process economics are barely affected by changing batch frontal filtration steps to tangential ones for continuous operation, precluding the waste of effort on it. In recent years, buffer-exchange steps targeted at reaching optimal load composition for the downstream process steps have been eliminated both by refined buffer options and by improvements in chromatographic media and membrane adsorbers. Thus, the main process steps for tangential-flow filtration (TFF) now include harvesting and final drug-substance concentration for drug-product formulation. Viral filtration can run in either frontal or tangential mode. All these TFF process steps typically run in a batch, repeated batch, or fed-batch mode. Design of continuous countercurrent TFF processes for concentration (Figure 3) and diafiltration is state of the art in other industries such as dairy processing (8). Continuous membrane processes such as single-pass TFF also have been adapted to process biopharmaceuticals (9). The main drivers here include processing time, buffer consumption, and cost of operations. Implementing single-use, continuous TFF can reduce unproductive membrane-refresh time, buffer consumption, and resulting costs greatly (10). Low-pH viral inactivation treatment is another process step that is currently conducted in batch mode but could be redesigned for controlled continuous operation. Plug-flow reactors with integrated ILD systems can adjust inlet and outlet pH and tightly control solution residence times. Coiled-flow inverters with 90° bends can enable reactors for continuous processing (11). ILD systems (Development Stage): Buffers and solutions for ILD need to be selected based on criticality of use, use patterns in production, and feasibility considerations. Companies often perform risk assessments from the choice of buffers up to performance qualification. Process engineers must define concentrate dilution rates, mixing behaviors and stability at processing temperatures, and in-line controls (e.g., conductivity, flow rate, pH, temperature, and for some applications optical analytical measurements such as UV). Operational ranges must be fixed together with set points. ILD Systems (Proof-of-Concept Stage): Based on those early stage development data, a matrix of all buffers and solutions to be handled by an ILD system can be established. It should indicate volumes, flow rates, and use patterns, providing a selection of representative worst-case testing scenarios. Primary tests at laboratory or pilot scale using comparable ILD technologies must demonstrate the proof of concept and help companies perform adjustments when needed. Technologies that control the ratio of diluent to concentrate include mass flow-meters coupled with pump controls, metric or rotary lobe pumps, proportioning valves coupled with mass flow-meters, and pressure control of feed tanks. qualification and validation documents (and performance data). Note that both stand-alone ILD skids and those integrated into chromatography units already are on the market. Commercially available systems can handle up to a 1:150 dilution factor with inlet flow errors under 0.5% (12). However, it is more important to specify the composition and flow rate of the outlet stream. Vendors typically guarantee errors smaller than 1% for conductivity. Continuous Chromatography (Development Stage): Based on different separation principles, MAb developers can choose among several continuous countercurrent options. Bind–Elute or Flow-Through Chromatography: Affinity chromatography makes use of immobilized ligands that are highly specific to target molecules. Process conditions are designed to target low dissociation constants during loading and wash and high dissociation constants during elution with step gradients. This separation mode is predominantly applied for MAb capture using protein A media. Load and buffer volumes typically are high, and media are relatively expensive. Capture processes can be standardized essentially among MAbs, which makes them an ideal choice for continuous chromatography. Ion-exchange, hydrophobic-interaction, and mixed-mode chromatographies are based on interactions between differently charged ions (or parts of biomolecules) and between molecules with different hydrophobicities. Such exchanges are much less specific than affinity binding. These types of chromatography often are applied as purification or polishing steps further downstream of protein A capture. Membrane adsorbers also can accomplish product polishing, mainly in flow-through mode. Load and buffer volumes used for these DSP steps are much lower than for capture chromatography. The stationary phases are less expensive than for affinity chromatography, and their process schemes are more specific to different MAbs. Thus, from a unit-operation perspective, associated gains in productivity and reductions in buffer consumption and cost are less important here when transforming batch operations into continuous ones. Several continuous chromatography processes and technologies are available commercially for laboratory and pilot-scale applications: BioSC from Novasep, Cadence BioSMB from Pall, 3C- or 4C-PCC from GE Healthcare, CaptureSMB from ChromaCon, and SMBC from Semba Biosciences. Some systems already are in use for manufacturing biopharmaceuticals used in clinical studies. Linear-Gradient–Based Chromatography: Separations based on linear gradients are necessary when particularly large molecules or those of widely different polarity/hydrophobicity need to be separated out. Considering specific chromatographic conditions, these require different processes and technologies from those described above. Gradients of pH, solvents, or salts ultimately control the resolution and quality of these separations. Continuous chromatography processes also applicable for aqueous buffers are available for currrent good manufacturing practice (CGMP) operations: e.g., Multi-Column Countercurrent Solvent Gradient Purification (MCSGP) from ChromaCon. Size-Exclusion Chromatography (SEC): Chromatographic separations based on the size of molecules in solution usually run in isocratic mode, requiring column regeneration after a certain amount of product has been loaded. Classical simulated moving-bed (SMB) processes apply when separations can be fractioned into one collection of a targeted product (eluting either before or after the impurities) and another of waste (eluting either before or after the target product). Continuous chromatography systems that can integrate more columns with process control that does not depend on product breakthrough can handle these processes. Examples include the Novasep and Pall systems mentioned above. Continuous Chromatography (Proof of Concept Stage): Early stage development of continuous chromatography starts with classical media and buffer screening batch experiments. Developers typically target separation conditions that provide the highest product capacity and yield while delivering high-quality eluates. Bind–Elute or Flow-Through Chromatography: Flow-through media must achieve high capacities for impurities and high yields of targeted product. For the next process optimization phase, performance criteria clearly need to be established. Characterization of each single step of the process sequence (e.g., equilibration, load, wash, elution, regeneration, and sanitization) allows engineers to optimize single- and multicolumn processes further, increasing productivity and potentially yield and purity, reducing buffer consumption, and so on. Linear-Gradient–Based Chromatography: During media and buffer screening, analytical and overloaded injections are performed under different conditions that allow for characterization of both adsorption and elution behaviors. Recycling of side fractions that do not meet purity criteria helps process engineers increase product yield (13). Size-Exclusion Chromatography: High resolution is needed between a targeted product and molecules to be separated out (e.g., aggregates, host-cell proteins, and process-related impurities) for SEC in batch mode, which is less important for processing in continuous mode. That is not the case for buffer-exchange applications. Such high resolution can be achieved with sufficiently selective media and relatively high column efficiency (typically >3,000 plates/packed column). Important to performance reproducibility are column bed structure, hydrodynamic behavior of the stationary phase (in presence of the load and the mobile phases), and design of columns and chromatographic systems. SMB-type SEC processes can be based on data obtained from a single laboratory-scale column. Modeling and Other Considerations: Continuously operated multicolumn processes are difficult to design. Thus, process-modeling software is helpful. Modeling, for instance, is based on experiments to define product breakthrough with wash, elution, and regeneration steps performed on a single column. Software such as Ypso Facto’s ChromWorks program (14) allows process engineers to compare performance objectively for different multi- and single-column processes. For industrial continuous biochromatography systems, some additional factors need to be considered. These include operation scheduling, materials compatibility, interest in and availability of single-use technologies, reliability of products and suppliers, and vendors’ technical, scientific, and regulatory support/experience. Process scale is based on upstream volumes. Drug substances have their own time and stability constraints, and downstream process requirements impose limitations, too. Developers must choose from several process control and monitoring options (e.g., how to define out-of-range material and isolate it) in addition to those related to automation, reporting, and traceability (e.g., integration of cleaning cycles, residence times, lot numbering, alarms and alerts, and cleaning reports). Process engineers have many choices of instruments and components (e.g., pumps, valves, and sensors) as well as programs for preventive maintenance, calibration, cleaning, sanitization, and (if necessary) sterilization. Finally, they must consider implementation timelines, risks, and costs of all the above, including qualification and validation documentation and long-term performance data. Membrane-Based Separations: Tangential-Flow Filtration (Development Stage): Two main process operations must be distinguished for the design of continuous TFF processes: concentration and separations (e.g., prepurification and viral filtration) and diafiltration (e.g., buffer exchange and product formulation). Both often get closely connected and integrated into a single processing unit during downstream processing. Tangential-Flow Filtration (Proof-of-Concept Stage): As for chromatography processes, test results from preselected single membrane modules will deliver the important design information for continuous processing. The following information is necessary for concentration processes: defined requirements for initial and final product concentrations and processing times; temperatures, viscosities, flux and pressure over time and across product concentrations; and cleaning and sanitization process requirements. For separation processes, developers need to define temperatures, viscosities, flux and pressure over time, transmembrane pressure (TMP) range, volume to be treated, and all cleaning and sanitization process requirements. For designing single-pass (without recycling) concentration processes, process engineers need to define the optimal membrane surface area, the number of concentration or separation stages and process configurations (with modules in parallel and in series), flux requirements, and TMP for each stage. For diafiltration processes, developers need to determine the optimum protein concentration for diafiltration; define temperature, viscosities, flux and pressure over time, TMP range, and retention rates for both the product and low–molecular-weight species to be washed out; and specify cleaning and sanitization process requirements. One TFF process, constant-volume diafiltration (continuous diafiltration) involves washing buffer salts (or other low–molecularweight species) out of retentate (sample) by adding water or a new buffer at the same rate as filtrate is generated. However, this way of processing can be considered as a concurrent batch operation instead. A load is completely charged at the beginning of the operation, and the salt concentration changes during operation. In such cases, the retained species is desired for recovery. A constant-volume batch diafiltration will provide the most efficient process mode with the shortest residence time. And a multistage sequence can be implemented for continuous process flow. Another technique of continuous diafiltration is based on single-pass TFF. Diafiltration buffer/solution is mixed, for example, into the feed lines of the second and third stages of such a membrane system. Cassettes in series have higher mass transfer than parallel configurations at equivalent residence times. To optimize process performance, residence times are extended in continuously run membrane processes for lower flux, longer channels, and smaller line sizes. Comparing data from standard recirculation TFF with single-pass TFF shows much higher conversion per pass (concentration factor), resulting in lower water consumption and increased product concentration at lower flux (9). Either standard laboratory modules with specific insert plates to apply the adapted process scheme can be used or specific TFF modules with optimized channel configurations. Design and Other Considerations: Process-design work can be supported by process-simulation tools and/or design curves (9). 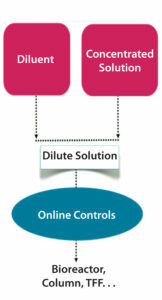 Process monitoring and control strategies need to be defined and specified. The influence of variability in upstream material (impurities, concentrations, and product) on continuous TFF operation needs to be demonstrated, as does robustness during process range studies. In viral-filtration applications, specific challenge tests are needed for validation. Currently single-pass TFF is under evaluation for continuous bioprocess applications but has not reached industrial production scale. pH increase with basic solutions to neutralize the solution. Development Stage: For continuous processing, pH adjustments can be achieved using ILD systems. 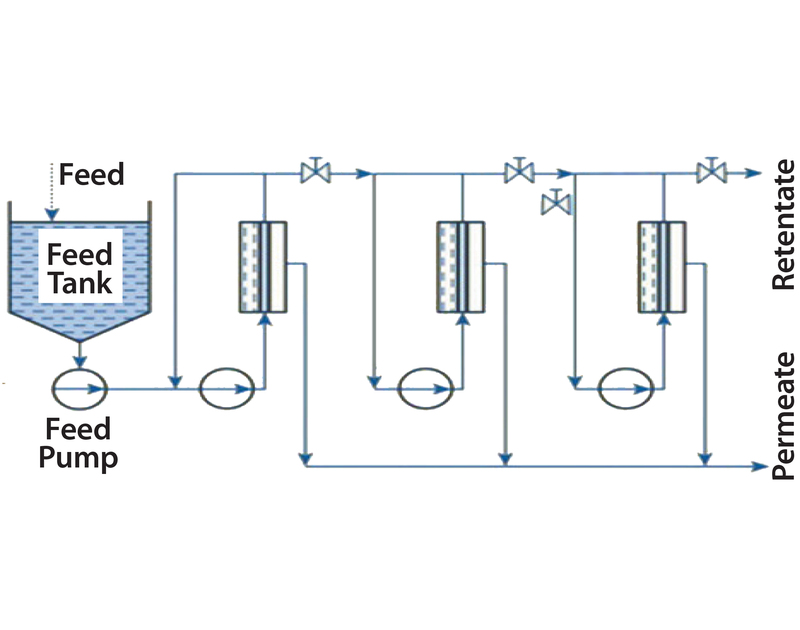 The simplest way to integrate this method into a continuous process flow is to run alternating batch reactors. Continuous virus inactivation processes should use plug-flow reactors because they can control exposure to low pH tightly. The volumetric capacity of such a plug-flow reactor depends on residence time and the necessary processing flow rate. Design: Based on typical residence times (1–2 h) and flow rates for protein A continuous chromatography eluates (50–300 L/h), the plug-flow reactor volume is in the range of 50–600 L. To achieve equivalent viral log reduction and aggregate values as in batch mode, similar design constraints as for heat exchangers need to be applied. Proper reactor design combines high-velocity turbulent flow with long residence times (using long pathways). So the reactor should consist of a very long and narrow pipe, but such a system would generate back pressure that is too high. Thus, an improved reactor design has been proposed: the “coiled-flow inverter” (CFI) operated at laminar flow velocities (Reynolds numbers <100) (15). Heterogeneities in radial concentration require conditions with enhanced radial mixing. CFI design elements (helix modules and 90° bends) allow for “Dean vortices.” This new design for low-pH viral inactivation currently is at the proof-of-concept stage. CGMP introduction will require more development and characterization. Much recent focus has been on CDSP, especially for MAb production. Developments mainly have been driven by potential quality, logistic, and economic benefits. With four main continuous-processing technologies for single-unit operations being developed, the results are impressive. But process principles, development and implementation strategies, and status are different for ILD, continuous chromatography, single-pass TFF, and low-pH virus inactivation. Presently ILD systems are used already in commercial production, continuous chromatography has reached the clinical production stage, and single-pass TFF and CFIs are in development. Meanwhile, process engineers are focusing on new intelligent ways to connect unit operations for process integration. Together with advances in process controls, automation, and process understanding, it is only a question of time before someone fills the first vials of drug product derived from CDSP. I gratefully acknowledge Dr. Henri Colin (managing director of Ulysse-Consult) for his contribution and Dr. Roger-Marc Nicoud (founder and CEO of Ypso-Facto) for inspiring discussions. 1 Bonham-Carter J, Shevitz J. A Brief History of Perfusion Biomanufacturing. BioProcess Int. 9(9) 2011: 24–30. 2 Sinclair A. Economic Analysis Continuous Downstream Processing for the Production of MAbs. BioProcess International European Summit: Vienna, April 2009. 3 Carius W. Celebrating 10 Years of Bioprocessing and the Opportunities Ahead. BioProcess International European Summit: Prague, Czech Republic, April 2014. 4 Hu-Primmer J. National Priorities: Continuous Manufacturing of Medical Countermeasures. Commercializing Continuous Processing in Pharma: Boston, January 2017. 5 Holzer M. Technology Migration from “White and Food Biotech” to Biopharma. Recovery of Biological Products XIV: Lake Tahoe, CA, August 2010. 6 Holzer M. Continuous Bio-Manufacturing — A Reality in 2014 or Rather in 2020. BioProduction: Dublin, November 2014. 7 Mahajan E, Holzer M. Sequential Multi-Column Chromatography. IBC’s Formulation Strategies for Protein Therapeutics: Anaheim, September 2008. 8 Tamime AY. Membrane Processing: Dairy and Beverage Applications.Wiley-Blackwell: Hoboken, NJ, 2013. 9 Casey C, et al. Protein Concentration with Single-Pass Tangential Flow Filtration (SPTFF). J. Membr. Sci. 384(1–2) 2011: 82–88; doi:10.1016/j.memsci.2011.09.004. 10 Meyeroltmanns F. Crossflow Filters Enter the Disposables Arena. BioProcess Int. 2(9) 2004: S48–S50. 11 Rathore A, Kateja N. A Coiled Flow Inversion Reactor Enables Continuous Processing. BioPharm Int. December 2016. 12 Wojtusik MJ, Willner K. Low-Pressure Liquid Chromatography Using the EcoPrime® with Enhanced Buffer In-Line Dilution. BioProcess. J. 15(3) 2016: 14–19. 13 Ströhlein G, et al. Continuous, Counter-Current Multi-Column Chromatographic Process Incorporating Modifier Gradients for Ternary Separations. J. Chrom. A. 1126(1–2) 2006: 338–346; doi:10.1016/j.chroma.2006.05.011. 14 Nicoud RH, et al. Designing Affinity Chromatographic Processes for the Capture of Antibodies: Part 1 — A Simplified Approach. J. Chrom. A. 2017: in press; doi:10.1016/j.chroma.2017.02.070. 15 Klutz S, et al. Continuous Viral Inactivation at Low pH Value in Antibody Manufacturing. Chem. Eng. Proc. : Proc. Intensif. 102 (April) 2016: 88–101. doi:10.1016/j.cep.2016.01.002. Margit Holzer, PhD, is scientific director at Ulysse Consult S.a.r.L in Luxembourg; m.holzer@ulysse-consult.lu.